British Airways is announcing a multi-million pound investment in its World Traveller (long-haul economy cabin) catering, introducing an exciting and expanded new menu, which provides more quantity and quality to both meals and great snacking options throughout the flight. The new catering arrives from January 17, and the menus that will change every six months. Carolina Martinoli, British Airways’ director of brand and customer experience, said: “Our customers tell us that when they’re taking a long-haul flight, great food and beverages make a real difference to them. It’s a huge driver of customer satisfaction so we want to make sure we deliver a great experience. With this multi-million pound investment we’ve focused on introducing more quantity and quality to the catering, delivering tasty meals and great snacking options throughout the flight. The airline’s customers will be welcomed with pretzels and a drink. Once they are settled in, they will be served a four-course meal such as a starter of couscous salad, followed by a main course of chicken casserole with an ale sauce, colcannon mash and seasonal vegetables, or a vegetarian tomato, farfalle and vegetable dish. Dessert will be a Pots & Co salted caramel and chocolate mousse, followed by biscuits and cheese. The meal will be accompanied by a bread roll and a bottle of Highland Spring water. On the shorter daylight long-haul flights to destinations such as New York and Dubai, fliers will also receive a sandwich such as egg and cress with a chocolate or Nutri-Grain bar. Those on longer daylight flights to destinations such as Cape Town and Hong Kong will receive a hot meal, such as a pizza wrap or a regional option, with a pot of pasta, a chocolate brownie and a drink as well as a smokehouse BBQ crunch Graze movie-snack box. A hot English breakfast will also be served on these longer flights that operate overnight. Customers on daylight flights from London will be offered a range of Magnum ice-creams, while those on night flights will be offered a tuck-box with options such as Dairy Milk Buttons, Twix, Kit-Kats and Mini Cheddars, which will also be available in the galley for them to help themselves to. The airline is also serving regional main meal options around its network, such as chicken in spicy cheng du sauce on flights to and from to China, Hong Kong, Japan and Korea, kathrikai milagu seeragam and channa dal on flights to and from Chennai, Hyderabad and Mumbai and acchari veg and dal palak on flights to and from Bangalore and Delhi. On flights to the Middle East (Abu Dhabi, Bahrain, Dubai, Kuwait, Oman, Qatar and Saudi Arabia,) customers can enjoy chicken in spicy Arabic sauce. Regional breakfasts will also be served including Chicken Congee for Far Eastern routes and an Indian option featuring: Idli Shanna, Sambhar, upma and dosa. The popular meal options for customers with special dietary requirements will continue to be available to book on ba.com/managemybooking more than 24 hours ahead of their flight departing. Travellers looking for a special treat can also pre-order meals on flights from Heathrow up to 24-hours before their flight. Options include a Gourmet Dining meal for £18.00, Taste of Britain and Taste of the Far East for £16.00 and a Great British Breakfast, a Healthy Choice meal or a Vegetarian Kitchen option all for £15.00. British Airways is investing £4.5 billion for customers over the next five years, covering the installation of the best quality WiFi and power in every seat, fitting 128 long-haul aircraft with new interiors and taking delivery of 72 new aircraft. The airline is also investing £600m specifically in Club World, including outstanding catering and luxurious White Company bedding – plus, from 2019, a new seat with direct aisle access. This year British Airways will start services to six new routes including Nashville and The Seychelles. *The airline’s longest flights serve: Bangkok, Beijing, Buenos Aires, Cape Town, Chennai, Hong Kong, Hyderabad, Johannesburg, Kuala Lumpur, Las Vegas, Lima, Los Angeles, Maldives, Mauritius, Mexico City, Narita, Oakland, Phoenix, Rio de Janeiro, San Jose (California), San Jose (Costa Rica), Santiago, San Francisco, Sao Paulo, Seoul, Shanghai, Singapore and Tokyo (Haneda and Narita). The first flight with the new catering on January 17 will be the BA117 from London Heathrow to New York JFK departing at 8.25 am. 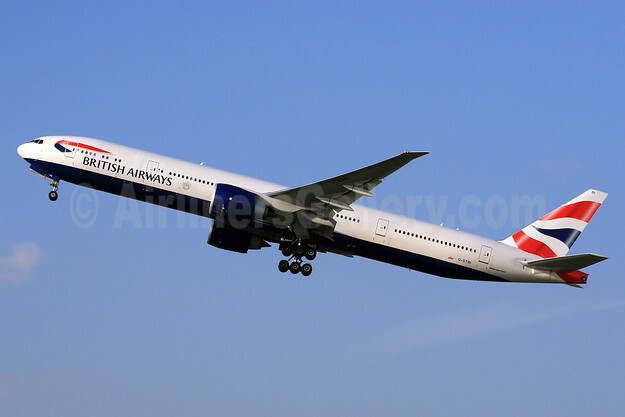 Top Copyright Photo (other by British Airways): British Airways Boeing 777-336 ER G-STBI (msn 43702) LHR (SPA). Image: 926790. This entry was posted in British Airways and tagged Boeing 777-336 ER, British Airways, G-STBI, LHR, msn 43702 on January 9, 2018 by Bruce Drum.